tibetan. 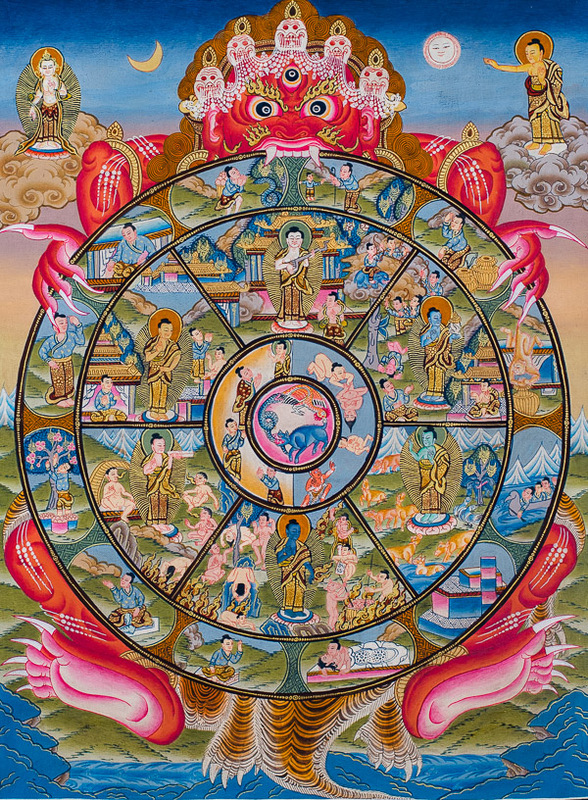 samsara or bhavachakra sanskrit. 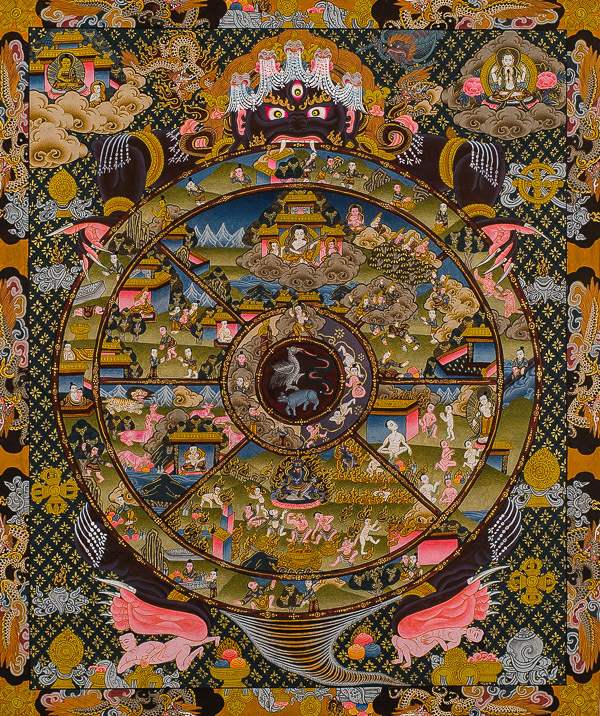 This Thangka is perhaps one of the most powerful examples of Buddhist Iconography. 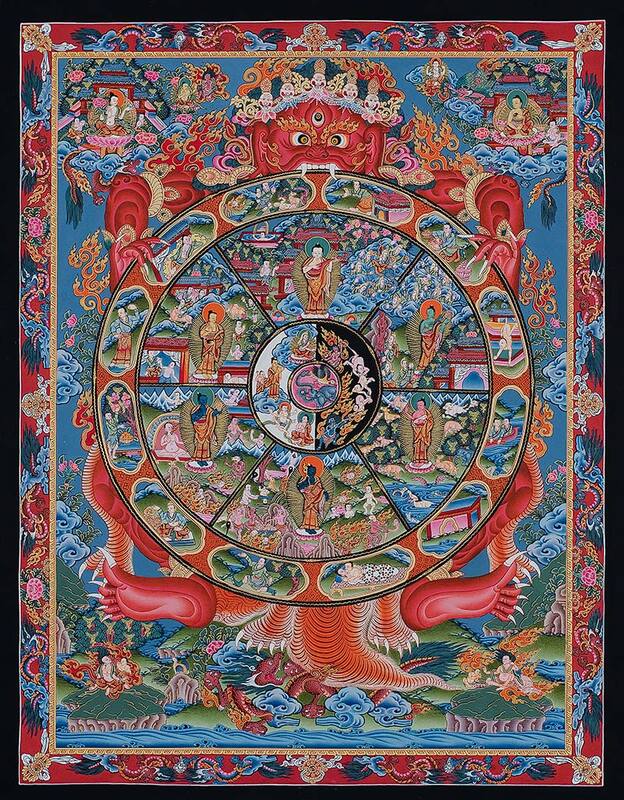 It describes the Buddhist philosophy and introduces the notion of re-incarnation. 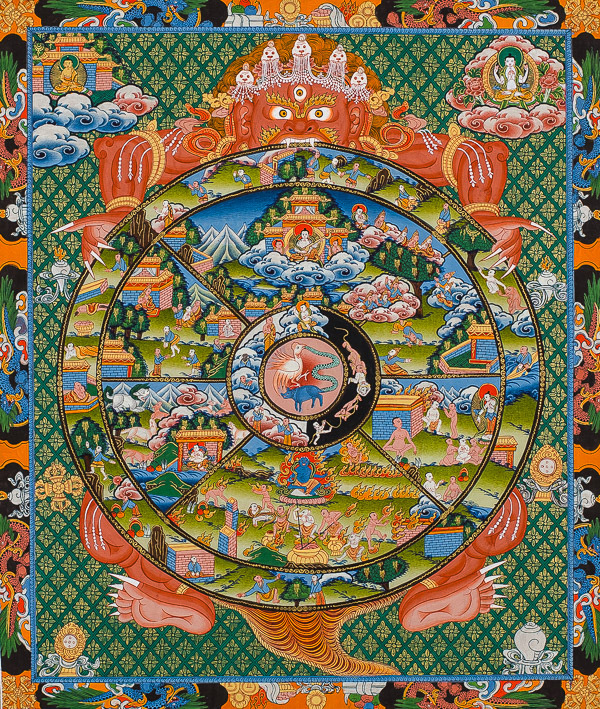 This painting is often found on the entrances of monasteries and is believed to have been used by wandering monks to propagate Buddhism in its early years. 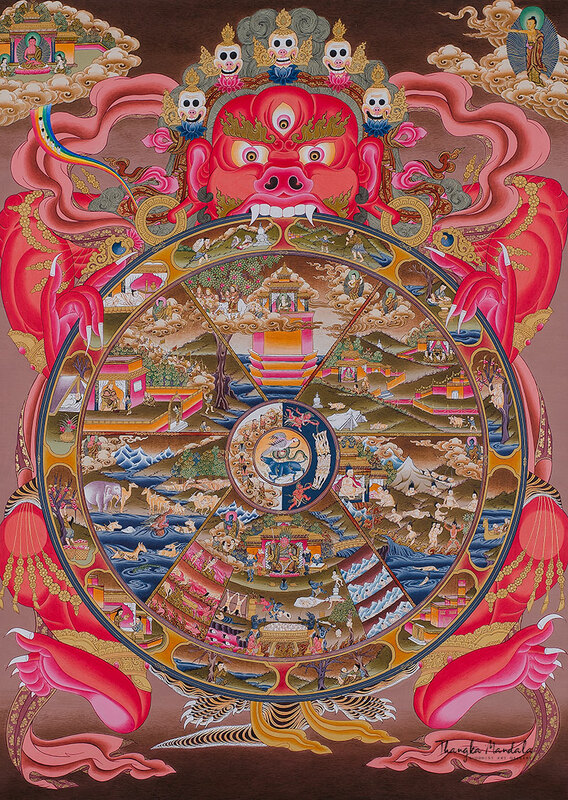 Samsara begins at the subconscious state of Bardo, continues into birth and is completed at the moment of death, thus the imagery or literal translation: the Wheel of Life. 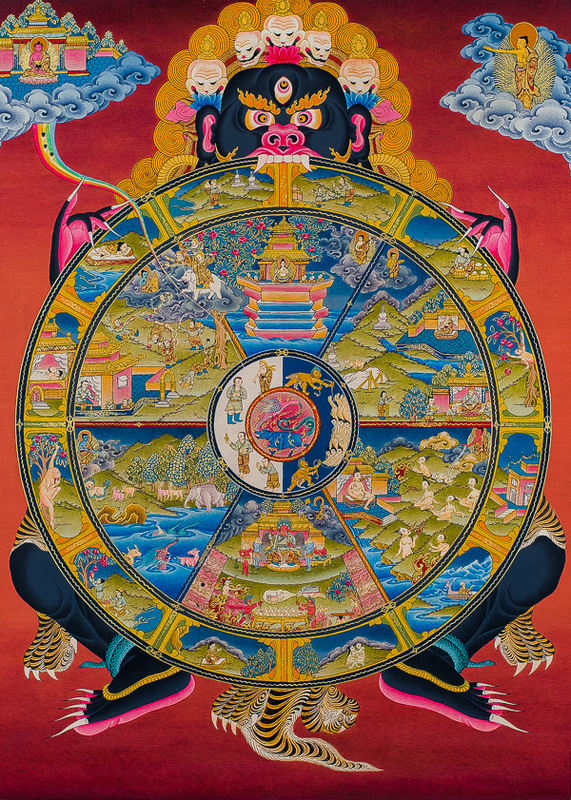 It is essential to understand that in Buddhist thought, all existences are conditioned by: ignorance, suffering and the unexplainable flow of time, represented by Yama holding the wheel of life. 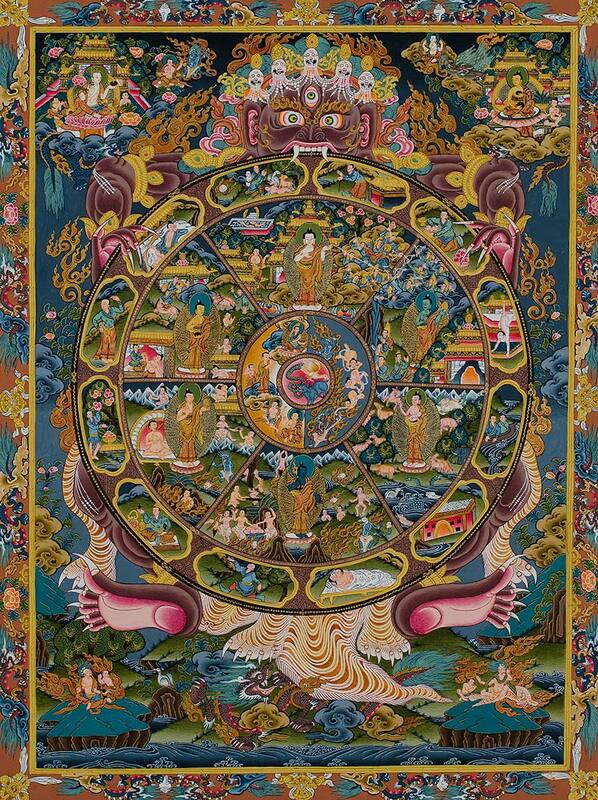 Nirvana, on the other hand, represents the world unaffected by negative emotions, which by definition is the nature of true happiness. 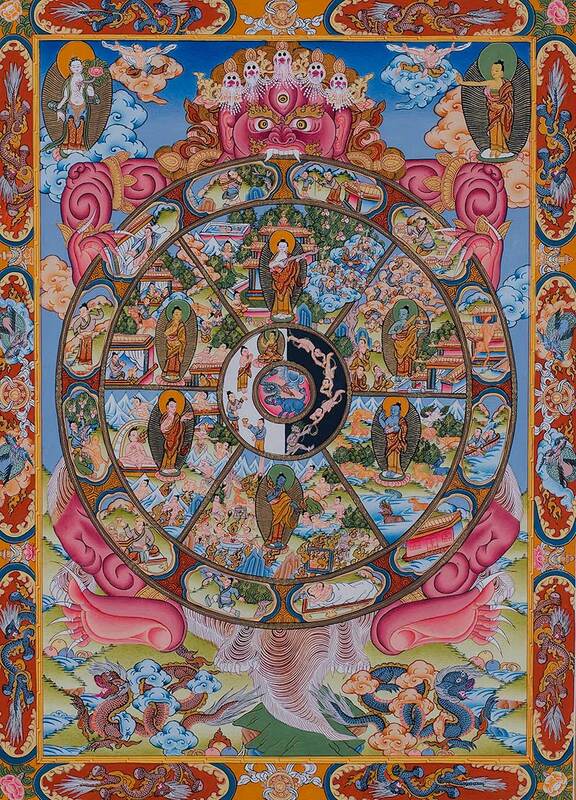 The endless cycle of birth, death and re-birth - or re-incarnation. 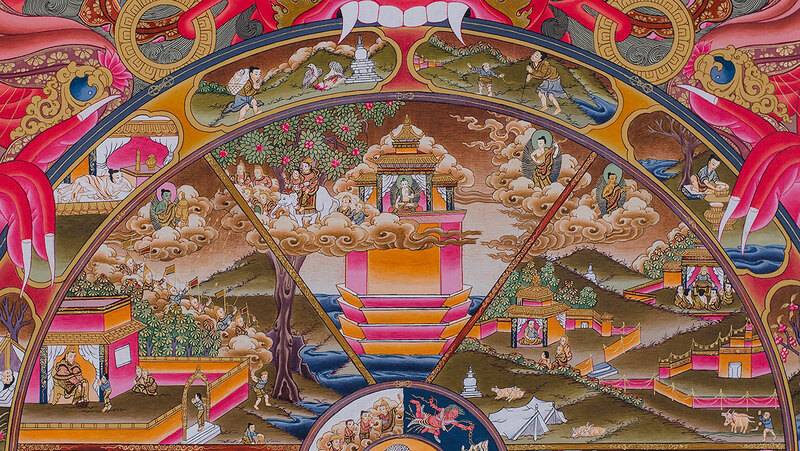 Three Upper Worlds (Gods, Titans and Humans) in which happiness is greater than suffering. 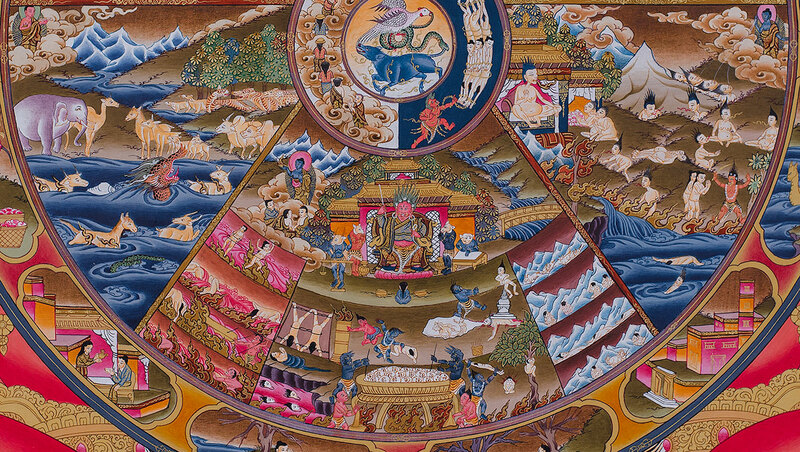 Three Lower Worlds (Animals, Hungry Spirits and Hell) in which suffering is greater than happiness. 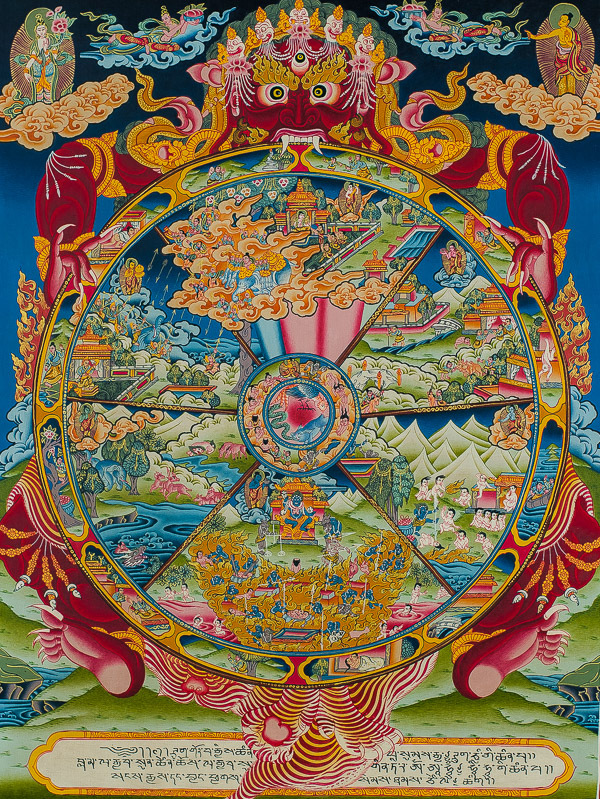 Individuals with similar Karmas, will have their consciousness experience a common perception, hence creating an identical world. Humans for example, all have identical sense organs (the 5 senses) which grants them access to an identical world (ours). 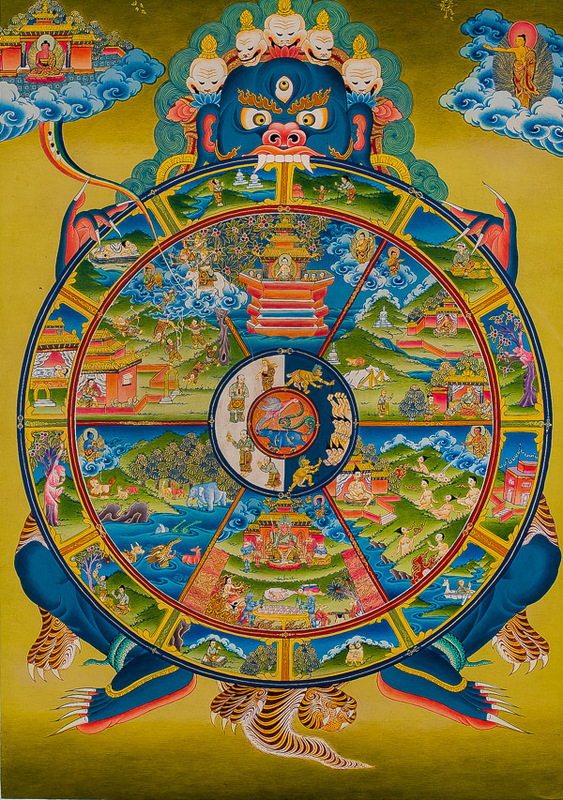 Buddhism however allows a multiplicity of possible manifestations, each functioning in what science would describe as a parallel "universe". We can only perceive ours and the Animal world. 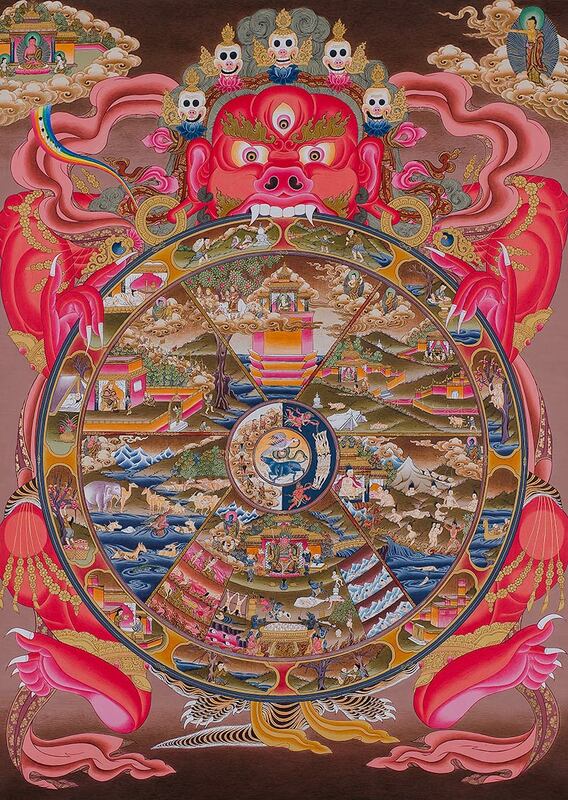 From a Buddhist perspective, the fact we cannot perceive the other worlds does not condemn their existence, but further proves that we are blinded by what we can see, touch, taste, hear and smell.. 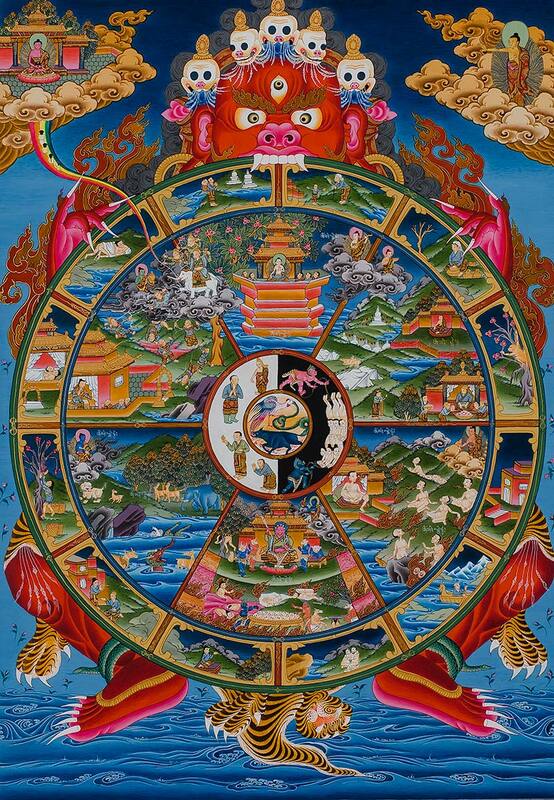 Please read the full Wheel of Life article in our blog if you wish to dive deeper into the meaning of the Wheel of Life. 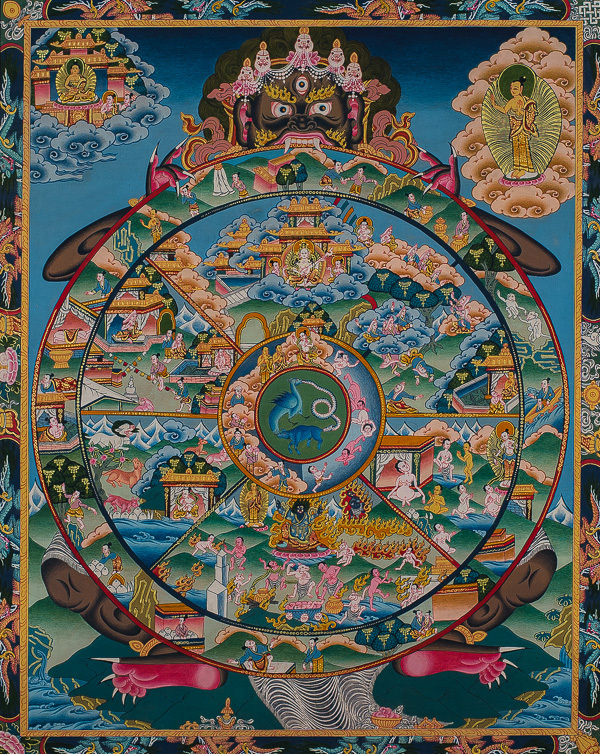 There exists many different styles and variations on the Wheel of Life, but it must be understood that these paintings reveal some of the most basic and fundamental concepts in Buddhist philosophy and the inmmense intricacy and precision of the work are testament to the thriving artistic culture of the Kathmandu Valley.